Place a dropcloth below where you will be working so that leaves and debris can be caught and taken care of after your gutters are emptied. 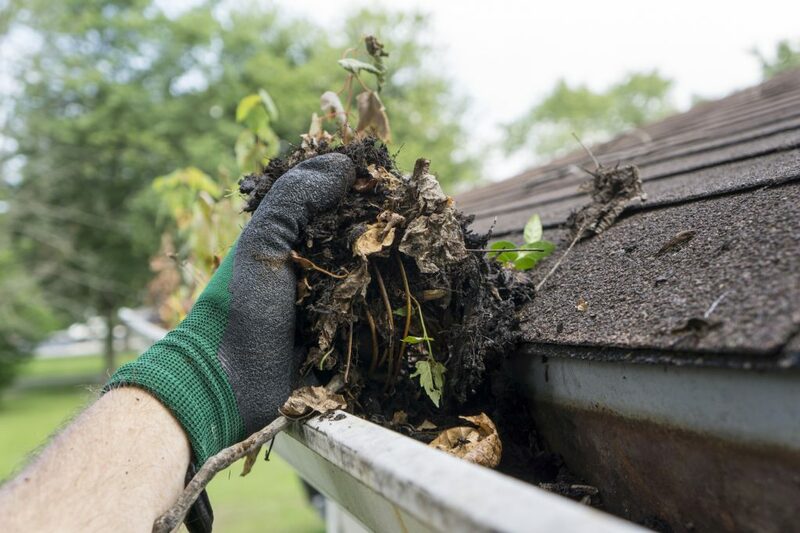 By getting rid of debris, you allow water that freezes and melts to easily escape your gutters. Are your downspouts clear of nests and other obstructions? Also, be sure your downspout is aimed away from your home to allow proper drainage come wet winter weather. Sometimes the sealant will deteriorate over time, causing your gutters to leak. Now is the perfect time to address those issues by replacing your gutter if necessary. When it comes to cleaning your gutters, safety should always come first. Use a sturdy ladder on solid level and well-gripped shoes.The safest plan of action is also to call a roofing contractor for home maintenance services.At Landmark Exteriors, we offer preventative maintenance plans to help you avoid costly repairs and keep you safe. When you sign up for a Home Care service, it saves you the hassle of remembering to pick up the phone and schedule your follow-up. Got more questions? Our knowledgeable staff is here to answer your questions and set up a schedule for your specific needs. Whether you need a maintenance plan or just a last minute-repair, we’ve got you covered! To speak with on one of our professional staff members, give us a call at 203.838.3838.